Morris Lambert served as Crew Chief beginning October 1970 and on Stallion 038 from April 1971 through July 1971. The aircraft was painted black with a great "nose art". A 50 caliber machinegun was mounted on the right side. A Xeon searchlight and 7.62mm minigun was mounted on the left side. 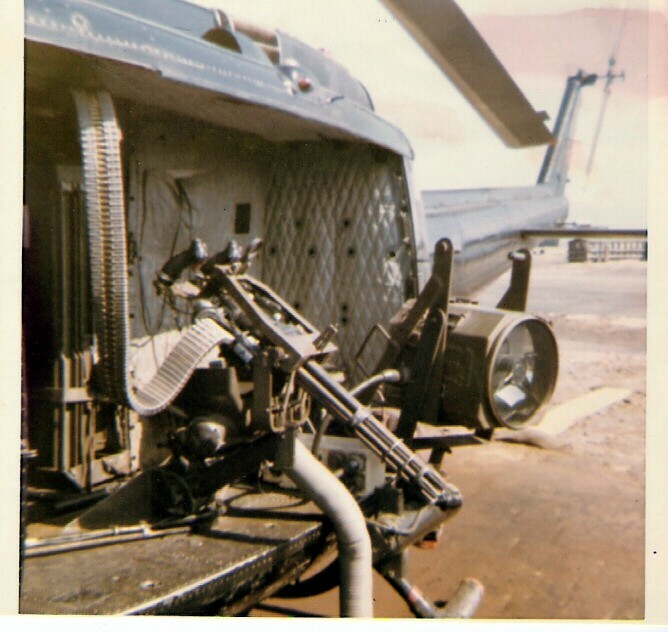 Awesome firepower for a Huey!!! the "Nightmare". 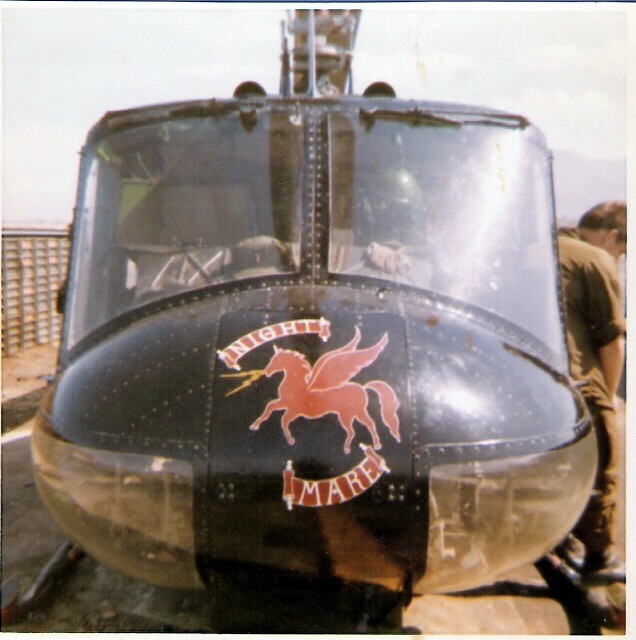 Neither I nor my crew named it the Nightmare nor did we paint the nose art, we just called it the night ship. We did however paint it black. I love the name and the artwork. I started flying the night ship as the Aircraft Commander late in my tour, we were assigned to fly night missions each night. 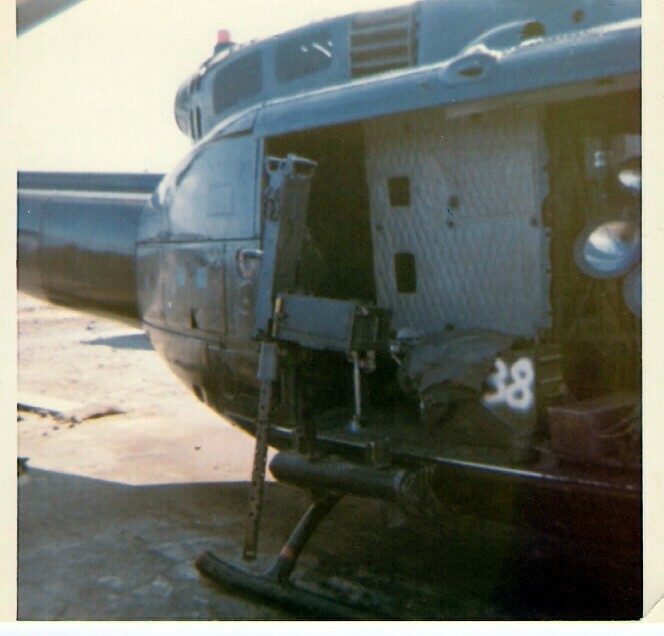 After taking fire on most flights I recalled that the Air force had Hueys with mini guns. 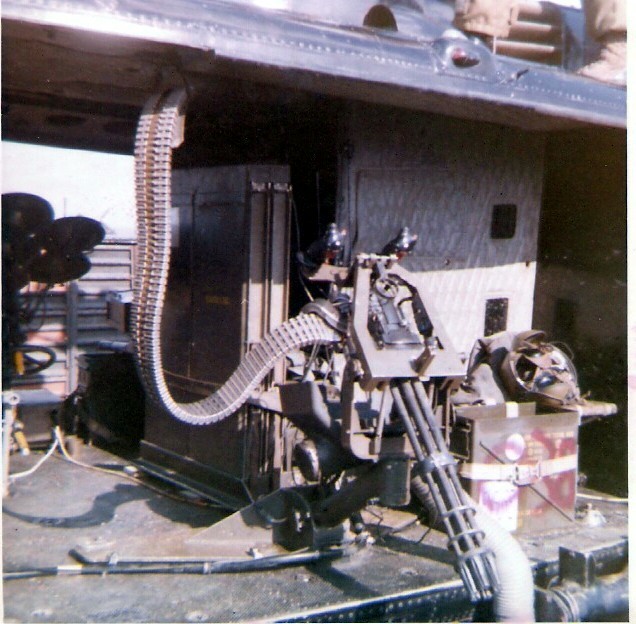 One day I visited a helicopter unit at Cam Rahn Bay inquiring about their mini gun setup. To my surprise the armorer in charge came from my home town, Spokane WA. In fact at one time he had lived just a few blocks from where I grew up. I explained that we flew missions at night and were regularly shot at. I also explained we patrolled the entire Cam Rahn Bay perimeter. 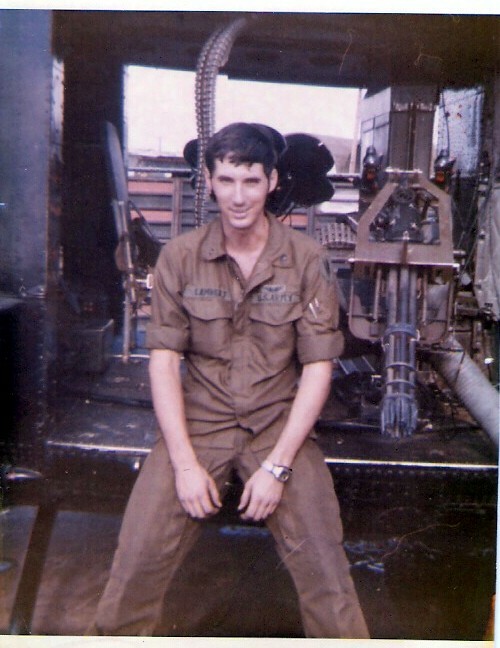 He volunteered to install the mini gun and to provide all support and parts for repair, such as barrels motors etc.. None of this was approved or authorized by anyone in the Army or the Air Force. Lots of rivets were removed and reinforcement riveted into the floor for the mount, which swiveled inside so the cargo door could be closed. 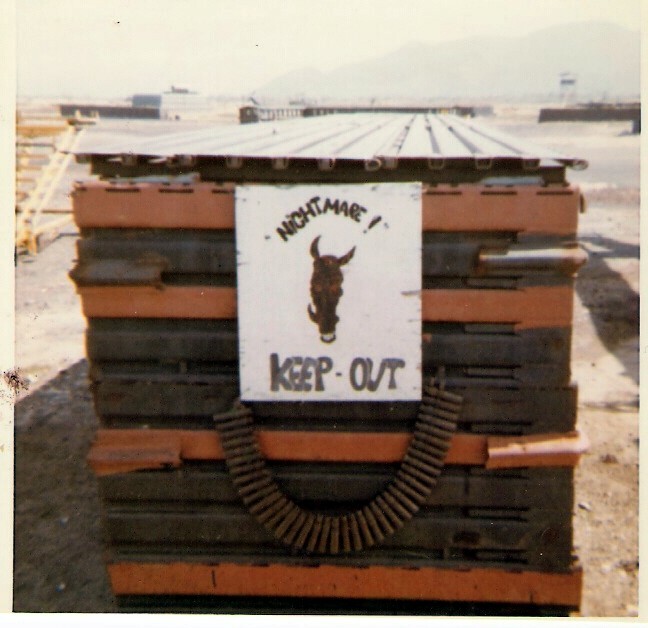 The ammo chutes were mounted on the back wall. I flew the aircraft to Cam Rahn for a couple of days. After the mini gun was installed, an armorer from the 92nd came out to look at the installation. He suggested he could mount a 50 cal on the other side and I agreed. Again this was not approved by anyone. I cannot remember his name, however he was on his 2nd or 3rd tour. He had survived a nasty helicopter accident as a crew chief, in a former tour and had several 3rd degree burns on his body and arms. He volunteered to return to Vietnam but was not able to pass a flight physical so could not be back on flight status. He accepted a job as the armorer. A great guy, I wish I could recall his name. reloaded and fired. Hell, I even fired my 38 pistol.The mini gun sounded like a loud siren, with tracers looking like a laser light. The interrupter switch had been removed so the barrels got so hot they glowed. The 50 cal was enormously loud and shook the airframe so badly all the instruments nearly pegged from one side to the other. I started screaming on the intercom to cease fire because I feared some kind of failure. It was so loud no one could hear or at least if they could they did not stop until empty. Pretty awesome to say the least. wondered what had happened to it. 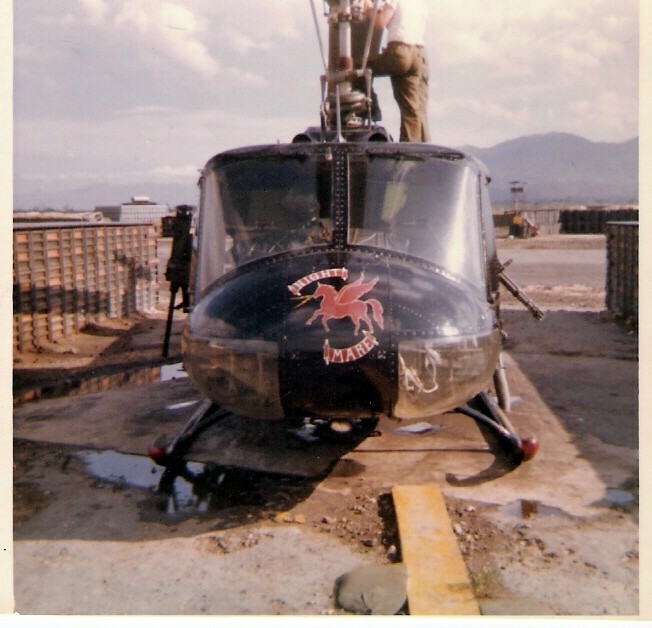 At the time the commander required us to fly it somewhere whenever a inspection team, battalion commander, or someone inquired about it. fire. Guess it was too scary? ?